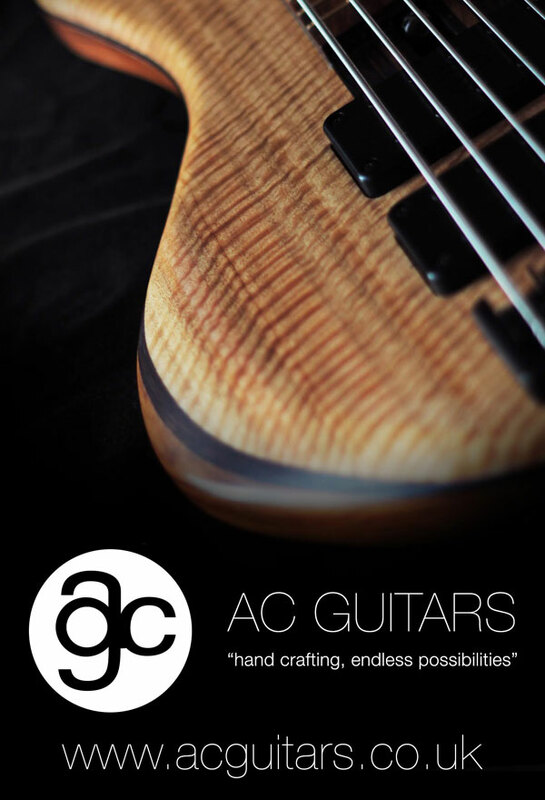 I’ve been very fortunate to have an Endorsement with AC Guitars, we decided to colaborate on a new idea for a Bass and here’s what we came up with. Here’s the Blurb on it. Much as the name suggests this is a design inspired by what has come before. tions then you will need to move up to the Custom Series. Alder with figured Maple top. Swamp Ash with figured Maple top. Tops can be left natural or coloured. 34” scale 22 fret finger board with 16” radius on the 4 string, 20” radius on the 5 string. Colours available black or chrome. Hipshot Type B 19mm spacing 4 string, 18mm spacing 5 string. Goth GB720 or Gotoh GB7 tuners. ACG PB split coil pickup with Ceramic or Alnico magnets. Series/Parallel coil switching via mini switch. ACG/East P-Retro with active/passive switching. East Uni-pre 4K 3 band EQ with active/passive switching. 4/5 string single pickup version £1875. 4/5 string dual pickup version £1975. Fretless Ebony with fret lines in maple £150.00. are ordering from outside the EU a selection of alternative finger board woods will be available.